14/20 Gold Filled 5mm Ball on Post Earring Findings with 1.3mm Open Ring ID, .7mm post thickness. Clutches included. Order 2pcs to make one pair of earrings. The Little Things In Life. Somewhere along the way, we find out they’re not so Little. Treasured Moments. Doing Little Things For Others. Giving Little Gifts. 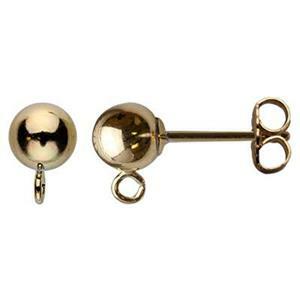 Our GF1945R is all of the above – 14/20 Yellow Gold-Filled 5mm Ball on Post Earrings. The Open Rings on these have a 1.3mm Inside Diameter opening, so you can add a little Gold-Filled Charm to “garnish” to your Small Treat.